Designs, repairs, modifies and fabricates aircraft, metal, plastic, composite, advanced composite, low observables, and bonded structural parts and components. Applies preservative treatments to aircraft, missiles, and support equipment (SE). Related DoD Occupational Subgroup: 603. Assembles structural parts and components to meet requirements for preserving structural integrity and low observable qualities. Assesses damage to aircraft structural components and low observable coatings. Advises on structural and low observable repair, modification, and corrosion protection treatment with respect to original strength, weight, and contour to maintain structural and low observable integrity. Ensures aircraft component balance is maintained. Assembles repairs using special fasteners and adhesives. Checks repairs for serviceability according to specifications and technical publications. Manufactures jigs, fixtures, forms, and molds. Paints aircraft, missiles, and support equipment (SE). Identifies, removes and treats corrosion using mechanical and chemical procedures. Applies corrosion protective and low observable coatings. Applies aircraft paint schemes and markings. Uses metalworking equipment and tools to form, cut, bend, and fasten replacement or repair parts to damaged structures and components. Fabricates, repairs, and assembles tubing and cable assemblies for aerospace weapon systems and SE. Maintains and inspects tools and equipment. Performs operator maintenance and service inspections on shop equipment and tools. Ensures lockout and tag out procedures are accomplished prior to performing shop equipment maintenance. Stores, handles and disposes of hazardous waste and materials according to environmental standards. Inspects structures and components and determines operational status. Interprets inspection findings, and determines corrective action adequacy. Posts entries and maintains maintenance and inspection records. Recommends methods to improve equipment performance and maintenance procedures. Uses automated maintenance systems. Inputs, validates, and analyzes data processed to automated systems. Clears and closes out completed maintenance discrepancies in automated maintenance systems. 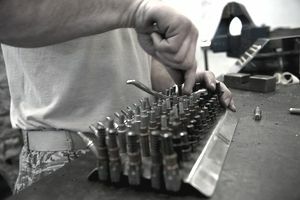 Knowledge: Knowledge is mandatory of aircraft construction features; identification and characteristics of aerospace materials; repair of metal, tubing, cable, plastic, fiberglass, bonded honeycomb, and composite structural components; shop drawing and sheet metal layout techniques; shop mathematics; corrosion identification, removal, repair, and prevention; cleaning of metals; application of protective coatings, low observable materials, and markings; proper use, mixing, and storage of acids, solvents, alcohol, caustics, primers, and paints; and proper handling and disposal of hazardous waste and materials. Education: For entry into this specialty, completion of high school with courses in mathematics, algebra, chemistry, physics, mechanical drawing, and metalworking is desirable. Training: For award of AFSC 2A733, completion of a basic aircraft structural maintenance course is mandatory. For award of AFSC 2A773, completion of a craftsman aircraft structural maintenance course is mandatory. Experience: The following experience is mandatory for award of the AFSC indicated: (Note: Air Force Specialty Codes). 2A753. Qualification in and possession of AFSC 2A733. Also, experience in functions such as fabricating, repairing, assembling, or installing aircraft metals, plastics, fiberglass, composites, or honeycomb parts; or corrosion identification, removal, and applying coatings and markings. 2A773. Qualification in and possession of AFSC 2A753. Also, experience supervising functions dealing with corrosion identification, prevention, and repair; applying protective coatings and markings; or fabricating, assembling, and repairing metal, fiberglass, composites, honeycomb, and plastics. Other. For entry into this specialty, normal color vision as defined in AFI 48-123, Medical Examination, and Standards, is mandatory. Required Appitude Score : M-44 (Changed to M-47, effective July 1, 2004).